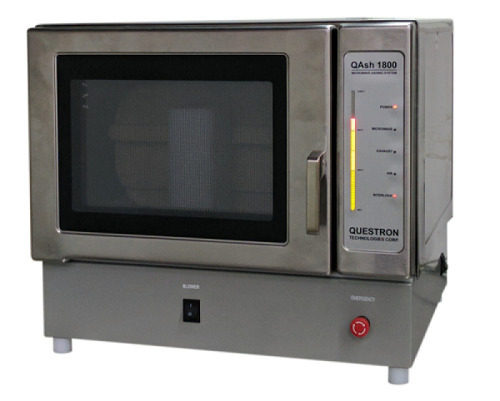 Questron’s QAsh 1800 is designed to perform many high-temperature microwave ashing furnace up to 97% faster than traditional muffle furnaces, giving you more time to conduct experiments. Questron’s Microwave Ashing System reduces exposure to fumes and heat with a built-in exhaust system that does not require placement of the unit in a fume hood. They have calibration software and NIST traceable accessories are available. While many laboratories still use a traditional muffle furnace or electrical furnaces to ash samples for process control purposes, these techniques can be time-consuming – often taking hours per run. This can result in high energy usage and ultimately, high operating costs. In addition, traditional furnaces tend to diffuse heat and odors while in use which can lead to an uncomfortable working environment than our microwave ashing furnace. Questron’s Microwave Ashing System, Qash 1800 reduces ashing times dramatically, often from hours to minutes, and offers the laboratory the most versatile way to ash samples. Its well-engineered design focuses on safety while eliminating corrosion, typical ashing odors, and greatly reducing the operator’s exposure to fumes. Questron’s QAsh Microwave Ashing system has resulted in a significant improvement in internal quality control and in some cases sample preparation procedures. People, at Questron, constantly strive to help laboratories in a variety of industries resulting in their desired efficiency.